Another day of decorating. The dining room tree, which I said I wasn't going to put up this year, but I did ....gave me trouble. The whole thing lit when I tested it, but when I got it up, the top was less than dazzling! So off it came and over an hour later, problem solved. It's times like that when you feel like opening the door and giving it a pitch! Pre lit...sometimes! That meant less time to fuss with the table, but I did a simple one for our dinner. 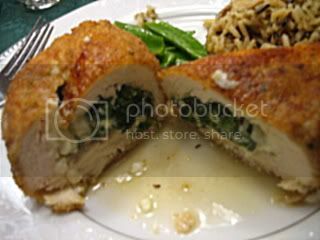 Tonight we had chicken cutlets stuffed with some feta, chopped onion, a pat of butter, chopped spinach. Mix it all together and put it in a pounded flat cutlet, roll, dip in egg wash, then bread crumbs. Either bake or fry...I brown it in the pan and then finish in the oven.. Served it with wild rice and snow peas..
Maybe some baking to bring to dinner..
Hope all of you are making better progress on your holiday preps than I am! We got a blanket of snow tonight, looks pretty with the lights...But I say NO to SNOW! Kathleen, beautiful post.... sorry the tree gave you trouble. That's so frustrating. Another gorgeous table .... I don't remember seeing the poinsettia plates... New??? I love feta and spinach and chicken ... what a great looking meal! Kathleen, I think you're doing remarkably with your holiday preps. Gorgeous table, Kathleen! I love them all and am looking forward to the finale! but all your tables are fab! That chicken looks fantastic! I wonder if I could order some in? 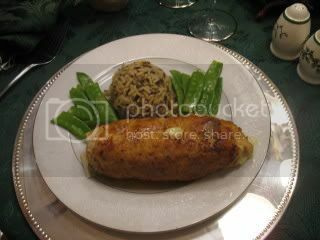 Your stuffed chicken always gets me craving! But you're a fabulous cook as well! It's icing on the cake. :) Beau, beau, beau! Psst... 24-degrees here overnight! (That's VERY cold for this area.) Our snow is not going to melt anytime soon. Kathleen, you do have wonderful tablesettings! I always enjoy them. 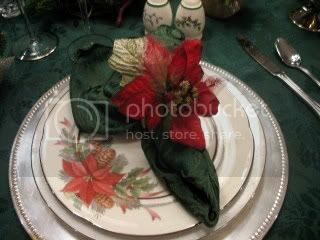 I love the pretty poinsettia and pinecone plates. Kathleen,so happy I found my way here and so glad you entered 'The Blog O Sphere World'. You always set such beautiful tables and create such delightful meals. It's only natural that you are here. I am full from having a lunch out..and could still eat your dinner. 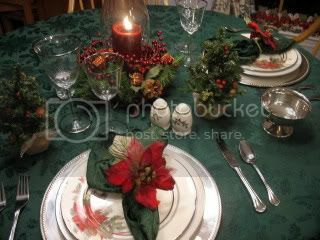 I agree you set such pretty tables..
Kathleen, whenever I see a pretty tablesetting, I think of you. We can always count on you to put your wonderful homecooked meals over the top with your place settings. Our weather has been like an airport recently. The storms have been lining up, one after another. Well, you can't say no to snow NOW:) More for tomorrow, too! and where are Wednesday through Saturday's tables? and the new stuff like Jain said? You can't still be out shoveling? And I still say NO to SNOW...but like many other people Mom Nature didn't listen.. I am working on a new post now...be patient! I am older than you! What a great blog! I just surfed in while having my morning coffee. That stuffed chicken looks delicious. I love those purple striped plates above and those new peppermint swirl plates.